Best Sanitizers, Inc. is helping food processors replace their outdated foot baths with a more effective solution. These are very versatile systems. The HACCP SmartStep and HACCP Defender provide processors with an effective tool in the fight against cross-contamination from footwear. For decades, food processors have been using foot baths (also called shoe baths and foot mats) as a method of reducing cross-contamination from footwear in their processing facilities. Typically, a foot bath is a large tub, trough or tray filled with some type of antimicrobial solution. The worker walks through the solution and saturates the soles of their footwear, thus reducing the number of potentially dangerous pathogens that may be there. However, foot baths have many inherent problems. Food safety specialists, Best Sanitizers, Inc. wants food processors to start the new year off right by thinking about a better solution to foot baths. Diminished Effectiveness: After the very first use, the antimicrobial solution’s effectiveness is diminished. The more workers that walk through the solution, the less effective it becomes. The only remedy is to dump out the old solution and add a fresh batch. Requires Frequent Monitoring And Maintenance: To maintain the foot bath’s effectiveness, frequent monitoring and maintenance is required so that the solution doesn’t become ineffective. This is labor intensive and costly. Inconsistent Results: With the footbath’s solution continuously diminishing, you cannot ensure consistent, repeatable results for each worker. Can be Avoided: Footbaths can be stepped over, walked around, and generally avoided by workers. Visually Unattractive: Foot baths are messy and visually unattractive. This can send the wrong message to customers and guests. 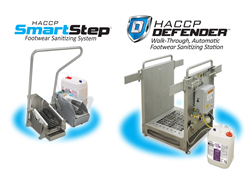 Best Sanitizers has a better solution: Enter the HACCP SmartStep and HACCP Defender Footwear Sanitizing Stations. These units use compressed air to deliver an atomized spray of Alpet® D2 or Alpet® D2 Quat-Free Surface Sanitizer to footwear soles. Unlike foot baths, each worker receives a fresh application of sanitizer for consistent, measurable results every time. The HACCP SmartStep™ Footwear Sanitizing System has a compact footprint and can go practically anywhere in the food processing facility. The unit is foot-operated and uses just 0.2 ounces of Alpet D2 Sanitizer per foot, which minimizes chemical waste and helps control moisture. This makes it ideal for dry processing facilities. The larger option, the HACCP Defender™ Low-Moisture, Walk Through, Automatic Footwear Sanitizing Station is ideal for applications where higher throughput is a must. The HACCP Defender one-way design also helps manage traffic flow and improves pathogen reduction to critical areas of the facility. Food processing facilities, nutraceutical plants, pharmaceutical plants, clinical research labs and clean rooms can use either unit individually or in combination to maximize pathogen protection throughout their facility. Since these units provide each worker with a fresh dose of sanitizer, there is no need for constant monitoring. Traffic flow can be designed to eliminate the possibility of workers avoiding the units, and the unsightly visual of a messy foot bath is replaced with a clean, effective piece of equipment. Visit: http://www.bestsanitizers.com for complete product information and video demonstrations. Since 1995, Best Sanitizers, Inc. has been providing the Food Processing industry with the highest quality hand soaps, hand sanitizers, industrial cleaners, and surface sanitizers available. In addition, Best Sanitizers offers cleaning and sanitizing equipment designed specifically for the food processing industry, including boot scrubbers, footwear sanitizing units, doorway foamers, drain foaming accessories, stainless steel racks, and proportioning and dispensing equipment. These products are used in over 9,000 U.S. food processing facilities. Best Sanitizers was the first company to achieve an E3 rating for an alcohol-based hand sanitizer, the first to achieve a D2 rating for an alcohol/quat-based surface sanitizer, and continues to explore new and innovative ways to deliver hand hygiene and surface sanitation solutions.